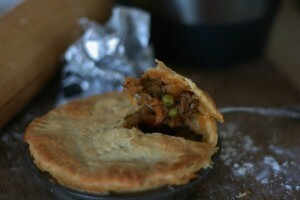 It’s winter time, perfect weather for a good ol’ steak pie. This recipe is so wonderful in so many ways…but mostly it’s the filling. From the depth of flavour and the tenderness of the meat, you would have thought that hours of stove stirring had been devoted to this dish. But instead, just ten minutes in the kitchen and let the Thermomix do the other 40 minutes work for you. Even a tough cut of stewing steak is tenderised to a delicious shred-able meat. I think that is seriously good. A cheap cut, cooked in only 40 minutes and the perfect steak pie filling. Even better is that the recipe cooks a kilo of meat, so there is enough for another meal, or a large family. You can either reinvent it the next night with a quick mash and steamed vegetables or freeze it for a ready-made pie filling some other night. The pastry is a new recipe for me. It uses ice instead of cold water and the result is super flaky. 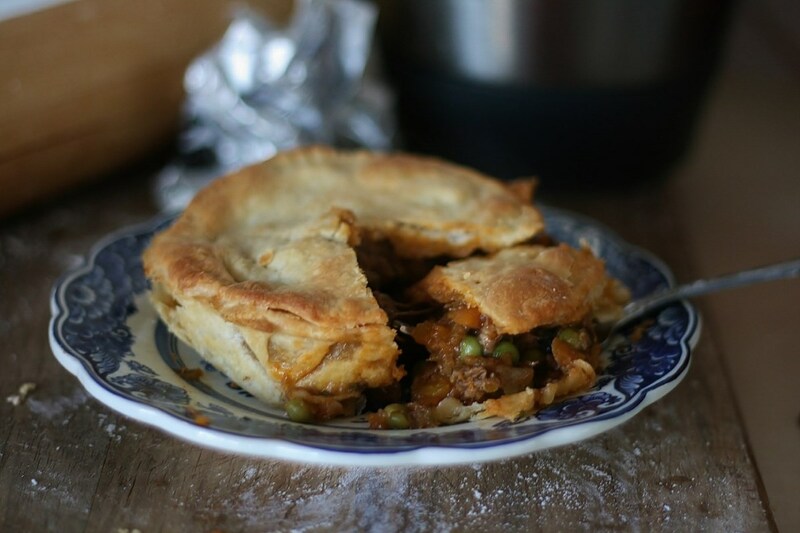 Taking only a few minutes to pull together and made from only a few ingredients, it will make you think twice about pulling the packet of puff pastry out of the freezer. Make the pastry beforehand and let it rest whilst the beef is cooking. Ten minutes before the beef is finished, pull it from the fridge and roll into shape. This time I lined the individual pie tins but often I will either make one large pie with only a top or place individual serves in my ovenproof breakfast bowls (Country Road make great little ones) and top with pastry. Whilst my family loved the delicious pastry, using a little less of it is certainly a healthier option. Because I am obsessed with including as many vegetables as possible, I also steamed sweet potato in the Varoma and added that to my filling. I have provided that option in the recipe below. Place ice and butter into mixing bowl and chop 15 secs/ Sp 10. Scrape down sides of bowl. Add flour and salt and mix 5secs/Sp5. Scrape down sides of bowl and knead 2mins/locked lid/interval button. Turn onto floured mat or ball and bring together to form a ball. Flatten into a disk, wrap and refrigerate for 20-30 mins. Preheat oven to 200'. When ready roll out pastry on a floured surface and cut circles large enough to line 4 small pie dishes with, having some pastry hanging over the edges. Re-roll pastry and cut four tops. Fill with pie filling, heaping nice and high and then place lids on top. Seal edges with a fork, trim excess and prick the tops to allow steam to escape. Place onion, garlic and parsley in TM bowl and chop 5secs/Sp5. Scrape down sides of bowl and add olive oil to sauté 4 mins/Varoma/Sp2. Add diced beef and sauté 5mins/Varoma/Reverse/Sp1. Leave MC off. Shred the beef by hitting the Reverse button and slowly turning the blades up toward Speed 4 whilst peeping in the top of the TM lid. Shred as much, or as little as you like. Stir in frozen peas to the hot filling . Optional: Steam some diced sweet potato in the Varoma dish at the same time. Cook on Varoma temp. Stir in with the peas at the end of cooking. Thanks for this recipe it looks yummy. Hoping to try it tonight. Do you think it makes enough mixture for one regular sized pie rather than individual ones? How did the recipe go? I always love feedback. I think you will see from cooking this recipe that the quantity is huge. Well and truly enough for a large pie and some more. Hi Tamara, I really love your blog and have made a few of your recipes so far…to much success! Have this afternoon made this recipe and it is amazing!! The meat just falls apart and melts in your mouth and the flavour is really rich and full and I just love, with 4 kids, how it is full of veges (and they will never know ;). The pastry is a real treat to make too..so easy to handle (i too havn't made a pastry with ice, only the iced water method) I am really interested in how the pastry is going to turn out for me as it cooks. I have made one big pie and it is now in the oven!! Thanks again!! Thanks for such a lovely comment. I love to hear feedback on my recipes. Looks so good. Do you think I could use rump instead? Have so much of it in my freezer! Oh, what a good-looking old steak pie! It's the perfect heavy meal you can take with you, whenever you’re running late for an errand, or need a source of energy after a long workout session. You creation looks delicious and nutritious, and it probably is, based on the fine ingredients it had in it. Thanks for sharing your recipe with us!